There’s really something special about listening to vinyl. 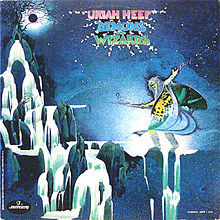 One of my all time favorite records to spin was Uriah Heep’s Demons and Wizards. The record was a hand-me-down from my brother who was a pretty big Heep fan. I believe it was the very early 1980s when he exposed me to this band. As I was converting my CD version of this album to MP3 today, it really made me realize how much I missed spinning records. This is certainly one album that is best heard through a needle. Sure, the CD sounds good but there’s just something about this album that screams to be heard on vinyl. I sold off most of my record collection years ago. Sometimes I regret it, but generally I don’t think about it too often. But today I am certainly missing it. Sometimes you just need that hit of nostalgia, ya know? Demons and Wizards was Heep’s 3rd album and the 2nd of what I call their Holy Trilogy. Look at Yourself and Magician’s Birthday being the other two. That was a good run of albums! I’d say the only song on this one that I don’t care for is All My Life, but I never skip it. When anyone ever asks me to recommend a Heep album to them, this is the one I tell them to start with. So, if you don’t own this and you like classic prog and psyche rock, this is something you should check out. Who couldn’t love this song? yes both of those are great! The “Easy Livin” sounds like slow Maiden (music) but more “boogie” perhaps. I love all the 70’s album art too.